I know in saying that these individual four-bite* pineapple jam “tartlets” aren’t Thai, I’d be stating the obvious. We love them, though, which explains why they’re found in pretty much every old-fashioned shophouse bakery — the kind that still sells pork floss-filled buns or piped butter cookies with tiny pieces of maraschino cherry on them. In terms of perceived sophistication, pineapple jam pinwheels probably aren’t placed anywhere near one of Bangkok’s latest “it” desserts, panna cotta. ** But, heck, these little gems aren’t going away any time soon. They have been around long before the invasion of the jiggly Italians and I predict they’ll continue to be around for a long time. This post is lovingly dedicated to Pom who spent his life staring at the ceiling — an avid fan of pineapple jam pinwheels. For me, it’s the quality of the pineapple jam that makes or breaks the end results. Pineapple jam that is too sticky and tooth-achingly sweet is a turn-off. By making your own jam filling, you can control the sweetness and determine the consistency that suits your taste. As long as the filling is sweet enough to compensate for the dough whose flavor isn’t so assertive and thick enough to form a ball without running/disintegrating during baking, it’s all good. Pineapple is best for this recipe, in my opinion. But you can also use any fruit that is sweet, tart, and pulpy. Apricots come to mind. Peaches would be nice as well. A fan of mango-lime jam, I’m also tempted to replace the pineapple with under-ripe mangoes. However, a word of warning: you cannot use commercial jams or jellies; they’re too runny most of the time to begin with, and have been gelled with pectin which loses its textural integrity in the oven. You need a fruit jam that has been thickened by being cooked down to a thick-ish paste of its own pulp. If you’re the type that makes their own puff pastry from scratch, I recommend this puff pastry recipe from Evil Shenanigans. For those who don’t mind ready-made puff pastry, feel free to use your favorite brand of frozen puff pastry. I used Trader Joe’s here. All you have to do is thaw out two squares of puff pastry, cut them into 9 smaller squares measuring roughly 3.5″ x 3.5″. Then make four diagonal cuts, starting from each corner about 1.5 inches into the center as shown. Take a big spoonful of the filling, form it into a ball, and place it in the center of each square. I hate to be too picky about this, but the filling:pastry ratio is kind of important. Each bite should give you enough filling to adequately flavor the amount of puff pastry that comes with it. I don’t know about you, but when a bakery is stingy with their pineapple filling, I think less of them. The pineapple jam is not a garnish; the pineapple jam is one of the two essential ingredients and deserves to be treated accordingly. And that’s the beauty of making these tartlets at home; just as you can control the level of sweetness of the filling, you can, too, control the filling:pastry ratio. 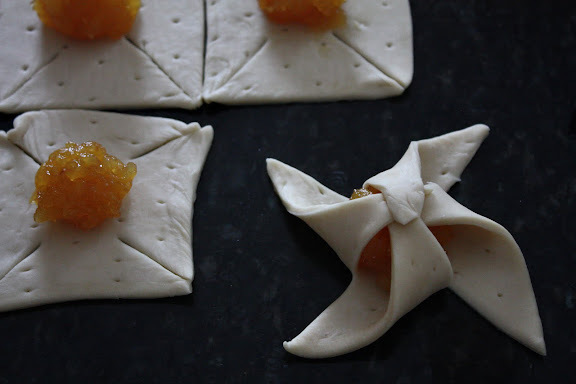 Once the filling is placed in the center of each puff pastry square, you form a pinwheel as shown above. There’s no need to do anything to glue the tips of the puff pastry together; just a light press on it is enough. Now, there are two schools of thought. One advocates the brushing of an eggwash on the puff pastry to achieve a nice color and a glossy sheen on it after baking; the other prefers to reinforce the fruitiness of the filling by baking the pastry naked then brushing melted fruit jelly on it afterwards. I belong to the latter group. 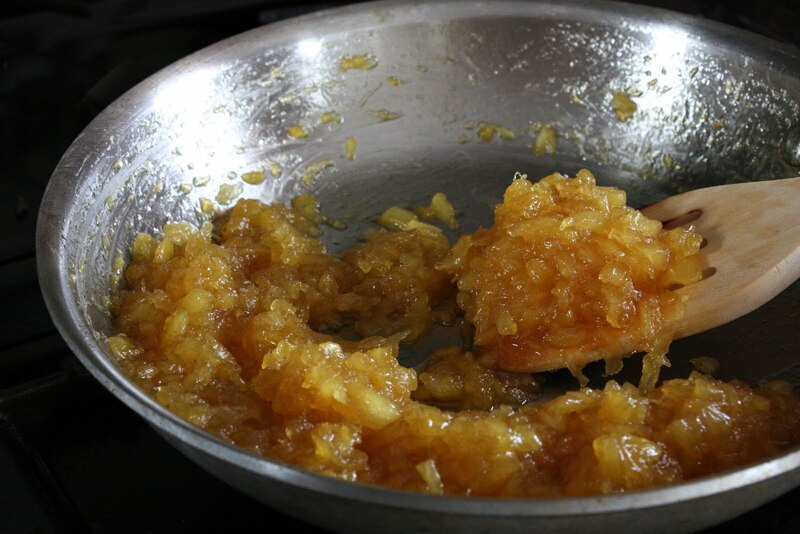 The glossiness you see here comes from melted homemade apply jelly, also known as Christine Ferber’s apple pectin stock. The downside to this latter method, however, is that it makes it difficult to store the tartlets on top of each other in one big container as they are kind of sticky. But, you see, I have never been in a situation where there are lots of these pinwheels left to store. In a large, wide pan, cook the pineapple, sugars, and salt over medium to medium-high heat. Stir the mixture occasionally and monitor the heat closely to make sure that the mixture doesn’t burn at the bottom or around the edges. Continue to stir until most of the moisture has evaporated. Assuming you use a large, wide pan (which allows for faster evaporation than a pot), this process should take about 30-40 minutes. Once the pineapple mixture has the consistency of a thick paste, stir in the butter, shut off the heat, and let the jam cool in the pan. The jam will thicken up a bit further upon standing. Once the jam has cooled completely, check the consistency by forming a ball. If you can form a ball that hold its shape, the jam is ready to be used. If it’s still too loose, put the pan back on the stove and evaporate the mixture some more until it’s thicker, then let it cool completely again. Preheat the oven to 400°F. Line two baking sheets with parchment paper or silicone mats. 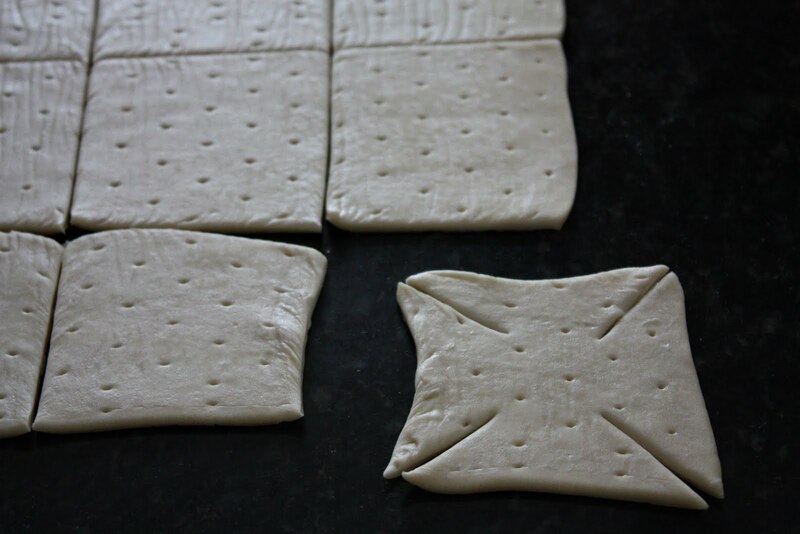 Cut each puff pastry sheet into 9 squares. Transfer 9 squares to each prepared baking sheet, allowing enough spaces between them. 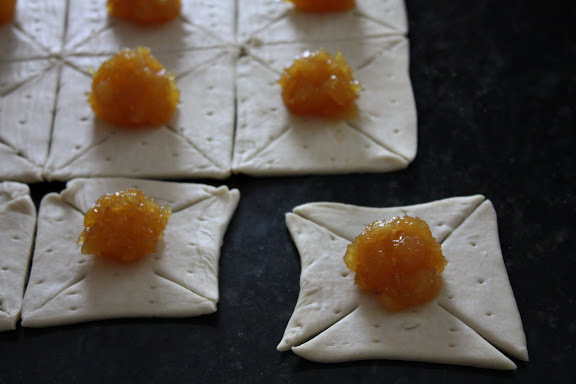 Form filled pinwheels and decide whether you want to glaze the pinwheels with an eggwash or apple jelly. This is all explained in the post. 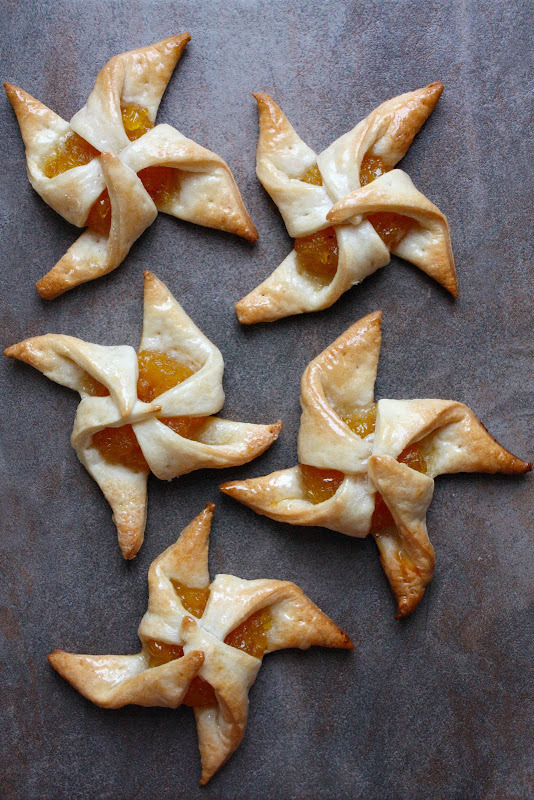 Bake the pinwheels for 20-25 or until they’re golden brown. Remove the baked pinwheels to a cooling rack. 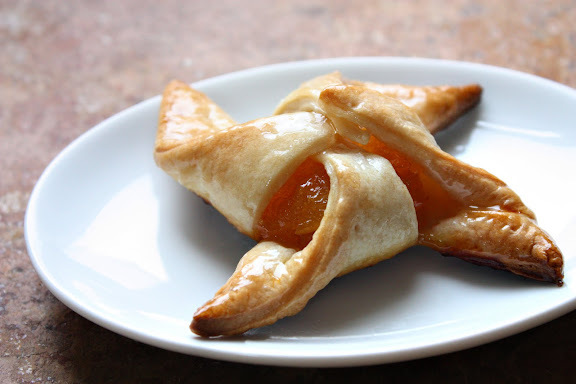 *You’re supposed to eat each pinwheel in four bites — one “blade” and 1/4 of the filling at a time. Some of us Thai kids have decided for you since we were in, like, 3rd grade that this is the only proper method of eating these pineapple pinwheels. **Insert a painful groan here. Nam Prik Pao (น้ำพริกเผา): Thai Chilli Jam – Secret Ingredient in Thai Spicy Stir-Fries, Salads, Etc. These sound wonderful and look so beautiful – perfect little pastries. Thanks for the step-by-step instructions on assembly! I made these for my blog once upon a time and did dough from scratch (but it w yeast), and last time I’m doing that, what a pain! These look gorgeous! I love these cookies. Thanks for the recipe. Now I can make it on my own. I had them fresh in BKK and I’ve had them at the Asian grocery here. The ones here looked like little Ritz cracker sandwiches with pineapple jelly in between. They had no expiration date on the package so you don’t know how long ago they left the pier at Klong Toey on the way to America. Yuck. Alas, now I no longer have to suffer and eat old cookies thanks to you. I read the story about your cousin Pom. ลีลาใจดีนะ พี่สาวไมค์มีปากแหว่ง ตอนไมค์เด็กอยู่ ก็จำได้ว่าเด็กหลายคนว่าเขาเพราะปากแหว่ง ตั้งแต่เวลานั่น พอเห็นคนที่ไม่ธรรมดา ไมค์คิดว่าเป็นคนพิเศษ เพราะเขาไม่ธรรมดาเลย People are like flowers.. they are beautiful in their own way, no one more beautiful than the other. Michael – I know exactly what kind of pineapple jam cookies you’re talking about. They’re sold by weight from aluminum ปี๊บ and often taste stale. You can certainly make your own by sandwiching this pineapple jam between two plain Ritz crackers. Thanks. 🙂 Pom wasn’t related to me; he belonged to one of the families who lived with and worked for us. But, yes, he was so dear to me as I’m sure your sister must be to you. These look quite delicious and I love the gray background you chose for the top photo. When I first heard of pineapple jam on Homemade-S, I said to myself I’d have to try it. I’m glad you’ve reminded me. It sounds great! I love the instructions for eating them one arm at a time too. Sounds like it’s not like cream biscuits, where there’s divided camps on eating them whole, or splitting them and licking out the middle. These look so delicious and beautiful. I’m definitely having a go at them next week. They’ll make perfect snacks for The Biggest Loser (just don’t tell Jillian and Bob!). Thanks for all the detailed instructions and beautiful photos.